What’s worse than being a home underdog to Vanderbilt? How about getting blown out by the perennial SEC cellar dwellers, 45-31? The Commodores (4-4 overall, 1-4 SEC) routed the Razorbacks (2-7, 0-5) Saturday with a combination of long runs and successful screen passes in front of 41,800 loyal fans on an otherwise gorgeous fall day in Fayetteville. Most of us had gone in thinking this was the time for new coach Chad Morris to get his first conference win. It had been noted that Vandy’s football players had scored higher on the ACT than the Hogs’ average points per game this season but things were looking up. Arkansas had won its first game against an FBS opponent the previous week, and was hosting another team still looking for its first SEC victory. It now seems ridiculous to be casting stones, but Vanderbilt is not typically a team to be feared. The Razorbacks first played the prestigious academic university back in 1949, and had only lost to the ‘Dores twice before Saturday. The first loss was in 1950, when Arkansas was coached by Otis Douglas, generally considered to be the worst Head Hog of all time. Douglas’s three-year career on The Hill was bookended by 2-8 seasons, merely half the wins John L. Smith eked out in his Season from L.
Vandy’s second win over the Hogs came in 2005, when future NFL quarterback Jay Cutler directed their 28-24 comeback. That year’s 4-7 record was Coach Houston Nutt’s worst in Fayetteville, but his young team closed strong that season. Led by freshmen running backs Darren McFadden and Felix Jones, Arkansas won two of its final three conference games and fell short at #4 Georgia and #3 LSU by a combined five points. That 2005 loss to the ‘Dores illustrates the complicated nature of Nutt’s tenure at Arkansas. He was the last Razorbacks’ coach to beat Alabama (in 2006), and the last to beat current Alabama coach Nick Saban (in 2002, while Saban was still coaching LSU.) Nutt led the Hogs to the SEC Championship Game in 2002 and 2006. He also gave future NFL first-round draft picks McFadden and Jones one carry apiece in the loss to Vanderbilt. In the end, Nutt was ridden out of town on a proverbial rail. Arkansas finished 8-4 in his final season, beating top-ranked (and eventual national champion) LSU in the last game he coached for the Hogs. Nutt was two years removed from that season of only two SEC wins, but had done plenty in the meantime to fall out of favor. For the 20 years after Arkansas joined the SEC in 1992, two conference wins would be their low point. Joe Kines managed to beat three SEC foes in his only season at the helm. Danny Ford was shown the door after his third two-win conference mark in five years. Following Nutt, Bobby Petrino started with only two and three SEC victories in his first two respective seasons before righting the ship to go 6-2 in each of his final two. On April Fool’s Day, 2012, Hog fans learned Petrino had slid his motorcycle and Razorback coaching career into a roadside ditch, where the Arkansas football program has been mired ever since. The Season from L. mustered wins over Auburn and Kentucky, but Bret Bielema set a new all-time low for SEC records by Arkansas. His five-year career on The Hill was bookended by seasons with zero and one conference win respectively. That is Otis Douglas territory. Surely it couldn’t get any worse. Yet after getting run over by Vanderbilt Saturday, that’s exactly where the Hogs find themselves. It was assumed that Vandy provided the best chance for the Razorbacks to get their first SEC win this year. Instead, the Commodores were up by three scores before allowing a garbage time touchdown catch by tight end Cheyenne O’Grady with just over a minute left to play. Saturday’s pasting by the ‘Dores confirmed what has seemed obvious since the Hogs blew the lead at Colorado State in the second game of the season. Arkansas will not be going to a bowl game in Morris’s first season at the helm. In fact, the loss highlighted another apparent chink in the coach’s armor. In the 25 career games that Morris’s teams have trailed at halftime, they have gone on to lose 24 of them. The Razorbacks have a bye this week, and the time off to lick their wounds should do them well. 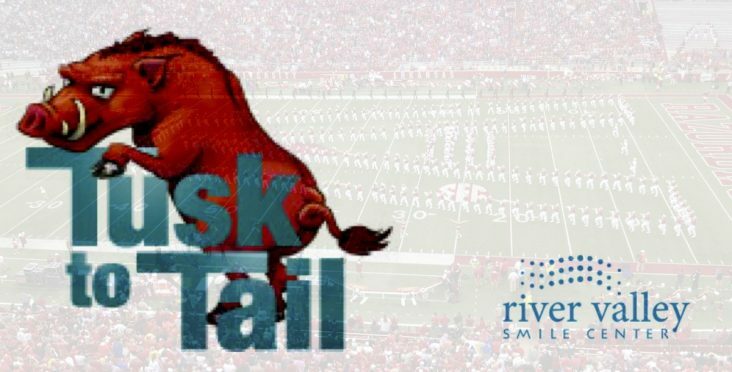 It will be the first time since Sept. 15 that Arkansas isn’t an underdog. After the bye week, there are still three more chances to get that elusive first SEC win, but it sure won’t come easily, if at all. LSU has been downright salty all season, but at least they play in Fayetteville. Mississippi State and Missouri may have fallen short of expectations, but both are considered to be better than Vandy, and road wins never come easily in the SEC. Morris continues to impress on the recruiting trail, gaining commitments from highly regarded athletes who should have a chance to compete quite quickly. I have little doubt that better days are ahead for the Razorbacks football program. But just like a hitter never wants his batting average below the Mendoza line, Morris is in danger of his SEC record being where nobody ever wants to be: underneath Nutt’s.